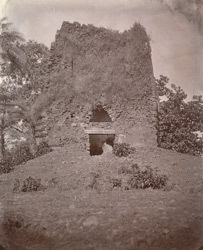 Photograph of a ruined temple at Deo Baranark, taken by Henry Baily Wade Garrick in 1881-82. In his report of a tour through Behar, Central India, Peshawar, and Yusufzai in 1881-82 (A.S.I. vol. XIX, Calcutta, 1885) p.20 Garrick wrote, "At Deo-Varunarak there are altogether seven early brick temples standing on a large brick mound (of these only two are large), a stone monolith and a very ancient tank." Garrick claims that the oldest temple at the site probably dates to the ninth or tenth century however it would appear that they were built a few centuries earlier than this. This photograph shows temple B, the second largest at Deo Baranark. The temple is twenty feet square with an inner chamber measuring eight feet across. The Shikara or tower is made up of twenty six courses of bricks. The temple was dedicated to Surya, a god associated with the sun and the entrance faces east. This is in the direction of the rising sun, which has a spectacular effect on the temple's interior on certain mornings. The temple is poorly preserved, which can be clearly seen from this photograph.